Do you need a Privacy Impact Assessment? Or do you need to amend an existing PIA? Privacy Impact Assessments are just one of the requirements you need in order to fulfill your obligations in Alberta’s Health Information Act (HIA) and other legislation and are an important aspect of developing privacy best practices in your office. And a little help along the way is always a good thing. 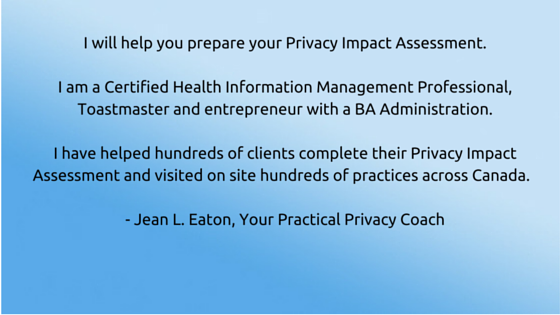 Practical Privacy Coach, Jean Eaton of Information Managers, is constructively obsessive about privacy, confidentiality, and security when it comes to the handling of personal and health information, particularly in primary health care settings. Jean has helped hundreds of healthcare providers, vendors, and health and social service delivery organizations and associations complete their Privacy Impact Assessment which have been successfully accepted by organizations' management and regulators. Jean has customized and delivered privacy training programs for privacy officers, records management professionals, implementation teams, and healthcare providers across Canada and the US. Now you can have access to five modules to help you learn everything you need in order to complete your own PIA. Each module includes a video training, as well as templates, tools, resources and two case studies to build on in each lesson. You can use this scenario to guide you through the PIA process – a process that applies to many services and retail industries, not just healthcare. 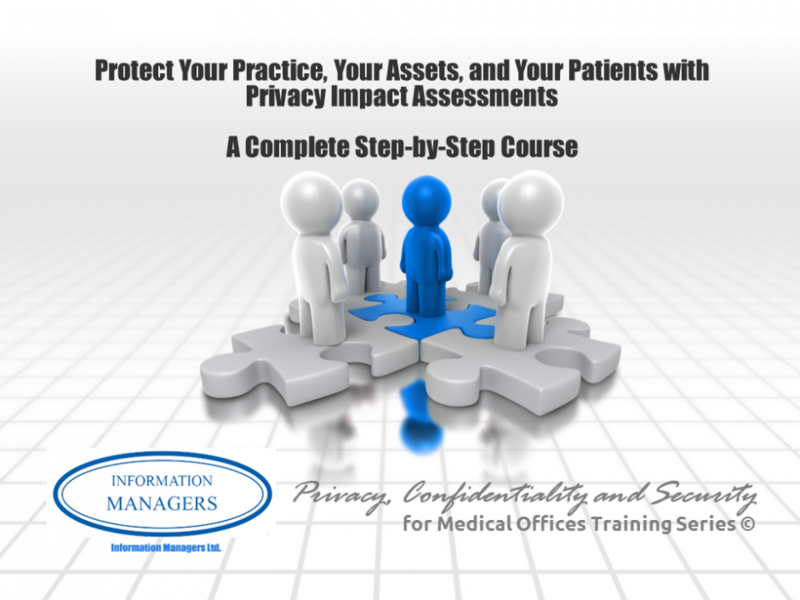 If you work in healthcare or privacy or records management and need to do a PIA, this e-course is for you. You are opening a new clinic or establishing a new health services program. You are sharing health information with another healthcare provider, organization, Primary Care Network or other health program. BONUS! Checklist to update your PIA to meet recent changes to Alberta's Netcare Portal. If your practice has completed a PIA and now you need to update the PIA, you receive a checklist of items that you need to consider to refresh your PIA. Jean has helped hundreds of physicians, chiropractors, pharmacists, and other healthcare providers complete their Privacy Impact Assessment. She has visited hundreds of practices across Canada. But time and geography limit my ability to visit each healthcare practice that needs a PIA. That's why I developed this on-line interactive course to help you learn everything you need in order to review, amend, or create your own PIA. Each module includes a video training as well as templates, tools, resources and two common case studies to build on each week. You can use these scenarios to guide you through the PIA process. Using a Webinar on-line interactive program, you will get great content and instructions from Jean Eaton and regular open office hours. The replays, tools, and resources will be available to you right away. If you are new to this field, I suggest that you first register for Privacy Awareness in Healthcare: Essentials to master the key definitions and concepts. Two sample case studies – one for a new PIA project and one for a PIA amendment – that we will use in each module. The case study is easy to understand by everyone. Use this approach for your PIA project. This E-course might qualify for CPE credits, too! BONUS! Open office drop-in group calls with Jean to help you get un-stuck with your PIA. BONUS! Checklist to update your PIA to meet recent changes to Alberta's Netcare Portal. BONUS! Private discussion group with other registered participants of this course to network and support each other on your PIA journey and continue to help you after this course closes. BONUS! Regular updates of privacy resources and templates that you can use. If you hired a consultant to do the work of the PIA process for you it may cost you as much as $3,000! And then…when the consultant is done, they take their knowledge out the door with them. Invest only $450 in this course and you'll have what you need to do your first PIA project today…and every project in the future! Not sure if the E-course is for you? This webinar is for Privacy Officers, Clinic Managers, Practice Managers and anyone else responsible for doing a PIA. You will learn what is getting in your way of getting your PIA done! Join us for the webinar so that you can plan your PIA for your healthcare practice! Please provide your email address below and you will be re-directed to the webinar replay right away. Check your email in-box to confirm your registration!